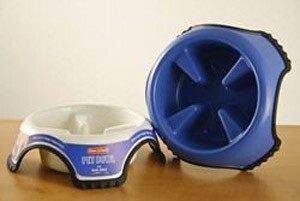 Slow Feeding Pet bowl with Anti-Skid jumbo. Details: Animal Instincts Slow Feed Pet Bowls have been designed to stop dogs eating too fast. The heavy duty plastic bowls are split into four feeding zones, which prevent the dog from putting its full snout into the bowl and therefore cannot get as much food into its mouth at once compared to a standard bowl. Also, after finishing each zone, the dog needs to adjust its position in order to eat out of the next zone. Animal Instincts Slow Feed Pet Bowls have an anti-skid rubber base, helping prevent the bowl from sliding and spilling food when the dog is eating. The bowls are easy to clean, dishwasher safe and suitable for both wet and dry food.